You’ll find truly magical engagement rings and wedding sets at #JeuliaJewelry - Susan Said... WHAT?! When my college roommate got engaged, she and her fiancé chose a vintage-inspired 3 carat garnet ring surrounded by tiny seed pearls. It was a stunning ring and absolutely perfect for her, if a little unconventional (or so I thought at the time). Many years later, while working for a jewelry design firm, I learned the real insider’s story on engagement rings. The “truth” I had believed my whole life — a diamond is the “traditional” engagement stone — was actually part of a crafty ad campaign by the DeBeers company during the 1940’s. And for many years, that campaign, and the accompanying marketing slogan “A Diamond is Forever,” stuck. But, today’s brides are a different breed altogether. Luckily, there are now many different – and beautiful – options for modern brides. One of the best resources I’ve found is Jeulia Jewelry. 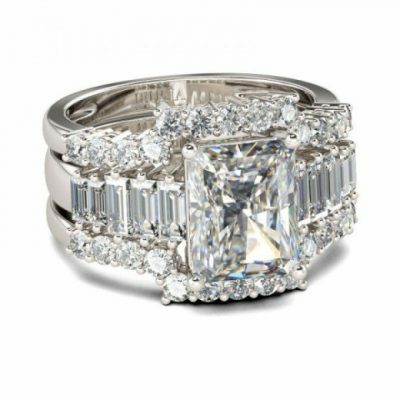 This company offers the most incredible selection of engagement rings, wedding bands, and wedding sets that I have ever seen. For example, the Jeulia 3PC 3.0 CT Radiant Cut Created White Sapphire Wedding Set, pictured above, has a stunning design with a central, radiant cut stone, surrounded by baguettes, with a halo of tiny brilliants on the twin wedding band surrounds. It’s beautifully crafted in genuine .925 sterling silver, with Rhodium plating for extra shine and maintenance-free wear. It’s a ring worthy of a Hollywood icon, a princess, or maybe just a Rockefeller. Breathtaking! And, I shudder to think what this wedding set would cost if these were diamonds. But, these beautiful sparkling stones are actually lab-created, white sapphires. And, while diamonds are undeniably beautiful, white sapphires rival high quality diamonds in both sparkle and fire. Plus, they far surpass diamonds of marginal or average quality. White sapphires are also infinitely more affordable. A brilliant, high quality white sapphire is still less costly than a poor quality, cloudy or flawed “natural” diamond. What is the difference between mined and lab created stones? Stones created in a lab are chemically, physically and visually identical to those mined underground. And, lab-created stones are often actually superior to naturally mined ones because they contain fewer flaws. Natural gems typically have inclusions from the crystallization process (gases and other minerals mixing during the molten stage of stone creation). But, lab-created stones rely on a steady, controlled process of applying minerals, heat and pressure, and usually have fewer inclusions. In addition to the stunning wedding set, shown, Jeulia Jewelry has so many options. Every bride is sure to find just the right style. A few of my personal favorites include the Ribbon Halo Round Cut Created White Sapphire Engagement Ring, the Three Stone Halo Radiant Cut Created Amethyst Engagement Ring, and the Halo Princess Cut Created Emerald Engagement Ring. There are even clever interchangeable bands with a variety of colored gemstones! In addition to engagement rings, both men’s and women’s wedding bands, Claddagh rings, and interchangeable rings, Jeulia also has an entire section of unique fashion jewelry, such as casual to dressy bracelets, trendy necklaces and more. 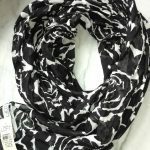 And, right now, save $30 off sales of $120 with the code CUT30 and $60 off sales of $180 with the code CUT60. To see the entire line, and hear comments from real customers, visit Jeulia Jewelry on the web, on Instagram and on Facebook. Is that wedding bells I hear ringing? 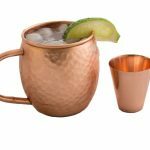 Gorgeous 100% copper Moscow Mule mug and shotglassset for chic parties all spring long! Easy Rafflecopter entry form and so many ways to enter the giveaway daily! Ends 4-10. PHOTO: Image used with permission by Jeulia Jewelry. DISCLAIMER: No financial compensation was received in exchange for this Micro-Pedi pedicure tool post. I did, however, receive a product samples of the 3 carat white sapphire ring shown, in order to test the product and provide an honest review. Regardless, I only recommend products or services that I believe will be good for my readers. Smart Giveaway! Case by PlusMotif keeps your iPad safe... and stylish!